I try not to use song titles as blog titles, but I was born in 1964. This means I was raised on rock and roll and FM radio. Petroleum runs through my veins from all those years of cheap energy—racing around in one of my father’s big Chryslers with the radio blasting and secret cigarette smoke blowing out the rolled down windows. “The Final Countdown” by Europe may very well be one of the worst rock and roll anthems of all time, except for the title, which appeals to every excitement junkie on the face of the earth. Don’t get me wrong, I’ve got nothing against arena rock bands and their anthems. If I had to choose one band’s song, I might select Survivor’s “Eye of the Tiger.” It’s got a beat I can really pound the pavement to, counting down to the completion of whatever chaotic project I’m championing in my never-ending quest to save the world through voluntary action. My never-ending quest to save the world through voluntary action. There. I’ve said it. So here I sit. It’s the final countdown here at the Mason family compound. There are a lot of plates spinning right now as I plan to move my technology and my bed down to my new old house on the hill. I’ve already moved my living room and my dining room…enough furniture to have hosted my first party over a week ago. As much as I love sitting up here on The Ridge, I’m anxious to get into the house. And I’m anxious to write more stories about small town life. I love writing about Moxie and The Moxie Recipe Contest and that’s become part of the story. 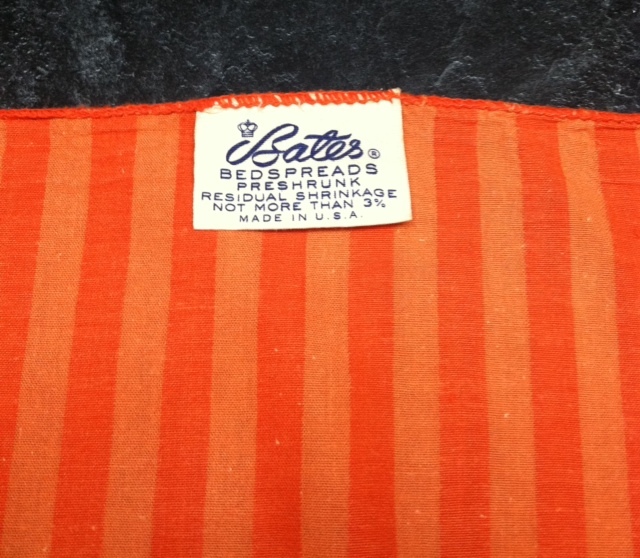 There are so many other stories to tell and I was reminded of a few of them the other day when I picked up a vintage orange Bates bedspread for one of the spare bedrooms at my new old house on the hill. Or maybe the Moxie Master Bedroom, I’m not sure. Oh, and it’s show house season in York, Maine and I still haven’t told the story of the night I slept in a show house. Then there are lots of people I miss. Like Uncle Bob. The last time I saw Uncle Bob was right before the Moxie Festival parade—over a week ago. Mon Dieu! I miss my parents. Ever since the day so many years ago when my father helped me build my Surprise Garden and my mother contributed her perennials towards the beautification of Lisbon Falls, my parents have “had my back.” They may not always understand what drives me to volunteer for crazy schemes and projects, but they’ve supported me through each one in large and small ways. One of these days, I’ll catalog their many generosities here for readers. I miss going to French Mass and Luigi’s with Slipper Sistah. I miss Jaxon. I hope he doesn’t think I’m angry with him. I haven’t done a good job of staying in touch. I think about him every day. I miss my Junior League of Boston BFF, too. Did you know she’s going to be the PRESIDENT of the league next year? I haven’t had a chance to write her an over-the-top congratulatory card. Sigh…it’s after 7:00 a.m. I’ve got to make the donuts. At least they’ll be Moxie Donuts with Moxie Glaze Drizzle, thanks to Kathy Veilleux. This entry was posted in Just Writing and tagged Anthem rock, Museums of Old York, show house season, The Junior League of Boston, voluntary action. Bookmark the permalink. Jab! I didn’t think for a moment you were angry with me. 🙂 Fantastic blogging as usual and I miss you too! I hope all is well. Congrats on the new house! Please call when things settle down.